“Global Security tendered for the security work of all our sites in 2009. They won based on the standard of their proposal and the flexibility and forward thinking they displayed along with competitive pricing. Global have kept our business because they make our security easy by providing all the services, consolidated invoicing, great reporting and a responsive Account Manager”. “I know I can trust Global Security to monitor that our stores are setting their alarms at the end of the day and that any activity outside hours can be reported on with no delays”. 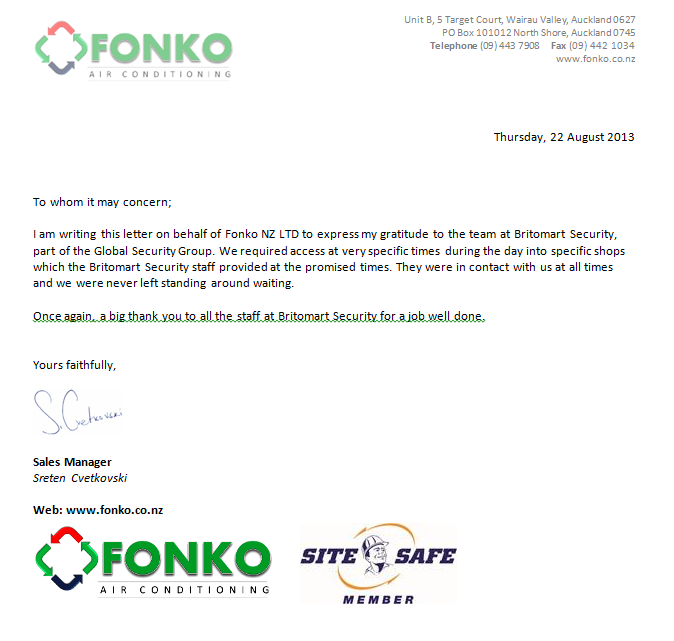 I am writing this letter on behalf of Fonko NZ LTD to express my gratitude to the team at Britomart Security, part of the Global Security Group. We required access at very specific times during the day into specific shops which the Britomart Security staff provided at the promised times. They were in contact with us at all times and we were never left standing around waiting. 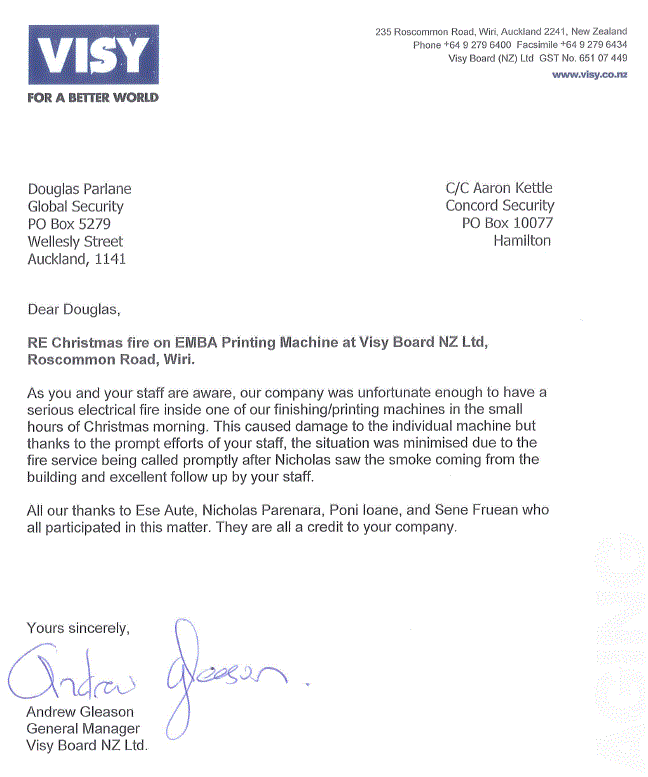 Once again, a big thank you to all the staff at Britomart Security for a job well done. In early 2010, Global Security was awarded the contract to supply technical support and alarm monitoring services for the security systems protecting the 100 branch network of Firestone Bridgestone acrossNew Zealand. This followed a competitive, full market tender process. Global Security’s winning attributes included their ability to provide a nationwide technical support and monitoring function, a demonstrated quality & depth of service suited for a large management company, supporting a large corporate, and an overwhelming level of enthusiasm, commitment and innovation by Ross Johnson and his management team. Of special relevance, their proposal removed all financial and operational risk associated with changing suppliers. Their operations staff then completed the predetermined implementation strategy to our total satisfaction. Since then, they have proven their ability to be responsive, flexible, provide detailed reporting and close CRM. We are very happy with our decision to select Global Security and will definitely look to work with them in the future. I provide feedback following our recent debrief meeting. You will be aware that being a company in our industry and with as many properties as ourselves, we take our security very seriously. To go further, we link this directly to the fundamental integrity of our business. I am pleased to confirm that you and your staff achieved a maximum rating in our post project assessment. Key components included – your initial briefing document to our branch managers, the collection of all relevant information and presentation of such to our board to achieve final sign-off, issuing me with weekly updates, the fact that every installation or reprogramming was completed as scheduled and your very effective CRM since. I am now happy to discuss further opportunities for your services within our greater group of companies. General Manager – Operations, Auckland. We write to pass on our special thanks to your staff for a very professional service in installing our new alarm system and providing your alarm monitoring services since. My husband and I had recently been burgled and thus were very motivated to be protected against such a horrible experience again. Your friendly sales staff responded at short notice and specified a comprehensive system at a competitive price. And your technicians arrived on time the very next day - plus they even vacuumed after themselves! We also have a great trust in your monitoring centre staff. Whenever we call them to modify our instructions or they have called us regarding a system issue or a general customer services topic, they are friendly, responsive and generally confidence inspiring. 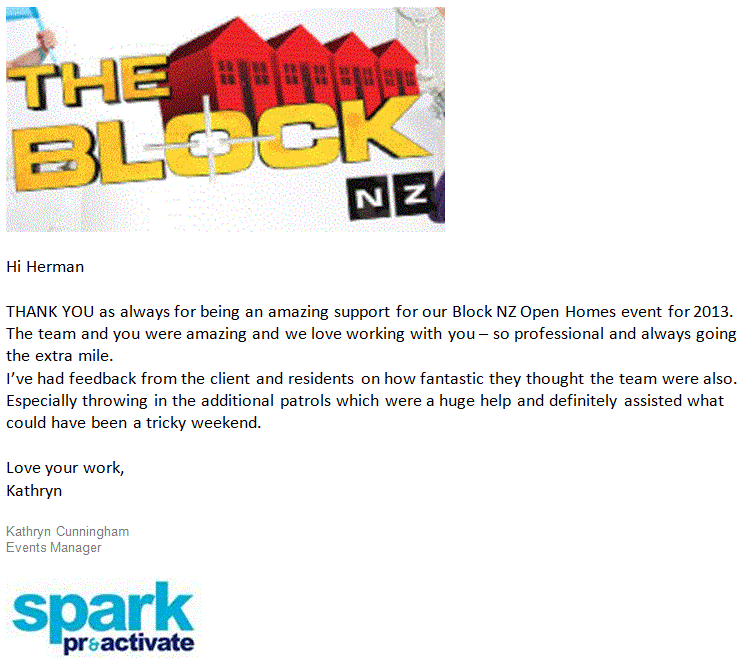 THANK YOU as always for being an amazing support for our Block NZ Open Homes event for 2013. The team and you were amazing and we love working with you – so professional and always going the extra mile. I’ve had feedback from the client and residents on how fantastic they thought the team were also. Especially throwing in the additional patrols which were a huge help and definitely assisted what could have been a tricky weekend.